Long time readers know of my concern (obsession?) with wine temperature. Summer is thus a particularly challenging time for me. I am constantly transferring wines from the fridge to the ice bucket to the freezer. I work on perfecting the frosted wine glass to combat the warmer weather. Is five minutes in the freezer sufficient to cool the glass down or does it need to be ten? What about the fridge? However, after recently stashing a bottle of wine in the freezer – and forgetting to take it out – I had a heat wave-inspired idea. Riesling Popsicles. Here’s how to make them – or try to. First, start with your Popsicle molds. These can be a little difficult to come by but craft stores should have them. In my case, the mold from Bed, Bath, and Beyond (as in, way, way beyond) also came with straws on the sides for those days when slushies are more appropriate. Paper cups and plastic spoons will work when desperate measures are called for or times are tight. Second, choose your Riesling. One beautiful thing about Riesling is you can leverage the International Riesling Foundation taste profile to dial in the style of Popsicle you want - dry, off-dry, or sweet. 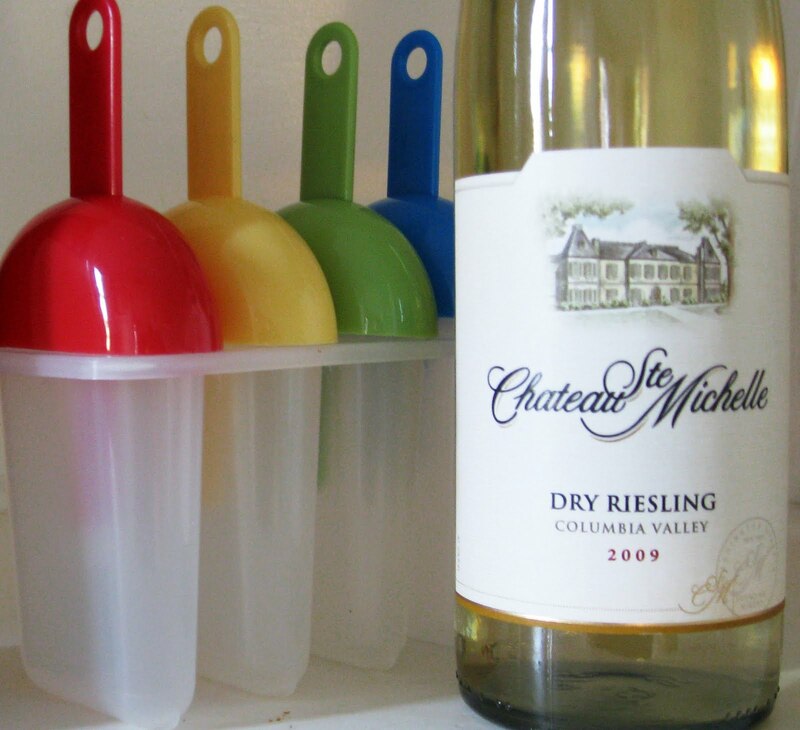 For my Popsicles, I used two wines – Chateau Ste. Michelle’s Dry Riesling as well as their Harvest Select Riesling, which is sweeter. 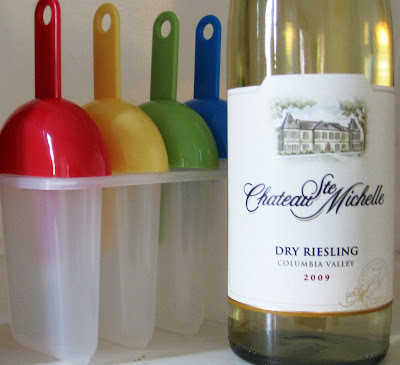 Third, pour your Riesling into the mold and place the Popsicles in the freezer. After the Popsicles have set in the mold – about two hours – turn the mold over to allow the Popsicles to set better to the stick. This is the critical step! Do it too late and they won't stick. Do it too early and things are FUBAR. I recommend putting something beneath the Popsicles in case they drip. Note that the style of Riesling you have chosen may affect how long the Popsicles take to freeze. Leave them overnight for best results. If you are using a German Riesling, make sure to use a timer. Finally, remove your Riesling Popsicles from the mold and enjoy - almost. Here’s the catch (there’s always a catch). First, there are some aesthetic issues when creating the Riesling Popsicles. 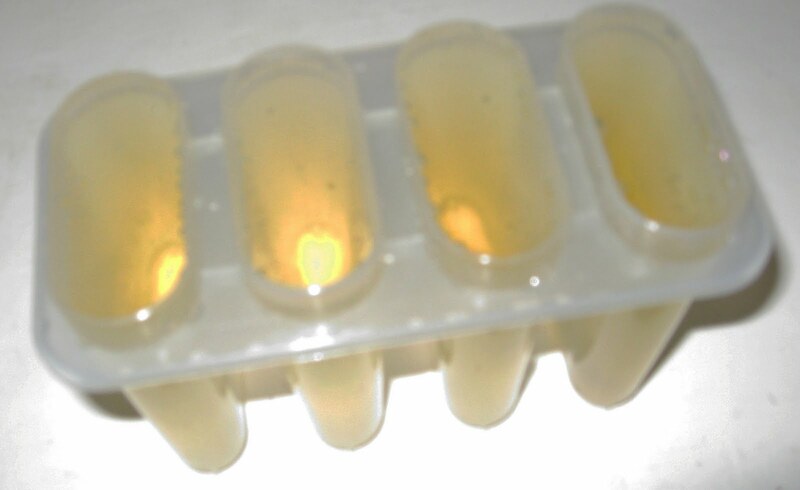 Clear Popsicle molds with Riesling look distinctly like urine samples. Second, and more importantly, the Popsicles can come out a wee bit slushy. Getting them to adhere to the stick can be tricky if not impossible. Having a bowl on hand - and spoon - is recommended. They require extremely fast consumption, which is, thankfully, not a problem. Some of your sommelier friends may tell you that the alcohol has come out of balance, but they miss the point entirely. I found the Harvest Select Riesling, which has more sugar, to be considerably more enjoyable. I am still trying to find the magic ingredient to hold the Riesling Popsicles together - I seem to recall a winemaker saying something about watering back? Liquid Nitrogen. Cryogenically freeze those puppies like Walt Disney's brain and they'll be hard as a brick. Not sure it would be a good idea to put one in your mouth at that point, but hey, it would stay on the stick. I will definitely try this with the sweetest riesling I can find. A late harvest would do great but the higher alcohol content would definitely lower the freezing point even more. Yep, liquid nitrogen is the answer. Oh, another thing, I call the trademark on "Winesicles". Can't wait to try this. One question. You advise "If you are using a German Riesling, make sure to use a timer." Is this because of alcohol differences or is it just that German wines demand greater precision generally? Chris, my lawyer - I should say lawyers, you can't imagine the numbers of them - are working on tradmarking the term Winesicles as I type this. Mike, thanks for stopping by. For the German Riesling, this is definitely due to the demand for precision. Did you see all those worried faces when the Riesling Rendezvous sessions started late? Taryn, I do believe a Riesling Popsicle party is in order! Sounds wonderful! I would add a little water to help w/ the freezing and maybe some food coloring to help w/ the urine sample issue. Can't wait to try my own version now! Day, let me know how it goes! Jared, darn. Otter pops. Why didn't I think of that?!? Sean, we tried this a couple of weeks ago with the Eroica 2006 Riesling Ice Wine. Our neighbors have one of those contraptions that make popsicles in 10 minutes. Decadent! The alcohol acts as an antifreeze, so any frozen concoction with alcohol will not freeze as hard as a regular popsicle. If you make wine into granita, it works really well. Andy, the Eroica Ice Wine? That IS decadent. Sounds delicious. You know...a lot of people think you all sound retarded. We are putting cold naked cherubs on our labels so Alabama will ban them. can you speed up with process with a fire extinguisher? I think I saw something familiar on Myth Busters awhile back. Wrap/Cover them up in plastic and let a full canister shower the cicles. If there is a wildfire near, save the extinguisher. Good idea, Smoky. Save the molds, the mess, the urine colored cycles, and just drink the half frozen bottle of wine, no glass, just straight out of the bottle..